Replacable Air filter element for 0.01 µm partical removal. The F72C Coalescing Filters are designed for use as a single in-line unit or as part of Norgren's Excelon® modular compressed air preparation supply system. 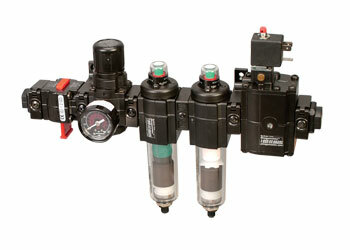 As a modular pneumatic component, this oil removing filter can quickly be attached to air regulators, filters, smooth start / exhaust valves, safety lockout valves and pipe adapters. With our Quickclamp® and Quickclamp® wall bracket accessories, a complete compressed air supply system can be assembled and mounted in minutes. The F72C oil removing coalescing air filter is a highly efficient oil removing filter for compressed air systems. These filters come with a 0.01µm partical filter and a visual service life indicator which turns from green to red when the filter element needs to be replaced. Coalescing filters should be used in conjunction with a 5µm general purpose filter upstream to maximize filter element life and optimize performance. Combination 5µm general purpose filter and coalescent filter combination units are sold below for your convenience. 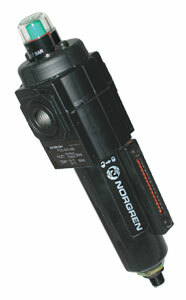 Note: Models listed include PTF threads, service indicator, automatic drain and a metal bowl with liquid level indicator. Maximum flow with 6.3 bar (90 psig) inlet pressure to maintain stated oil removal performance.